Note: bibliographical references noted here can be found in the “Modern Scholarship” section. Precedents: Single columns that supported statues of famous men or divinities were nothing new to Rome. In this sense the Column of Trajan is at least a partial product of an established tradition. It is the inclusion of a spiral figural frieze on the Column of Trajan, however, that appears to be a new invention (Lehman-Hartleben 1926: 3; Hamberg 1945: 120). 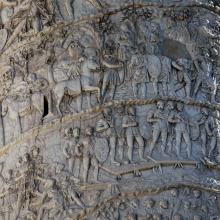 Becatti calls the “colonna coclide istoriata” (a column decorated with a narrative spiral frieze of figures) the “most original monument of Roman art,” without precedent in the Greek world or elsewhere (1960: 11). 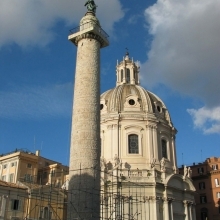 Yet Trajan’s Column did not appear entirely out of the blue. Columns from Roman contexts embellished with decorative motifs that spiral around the shaft of the column (such as floral decoration) can be cited, including those shown represented in painting and sculpture (Chapot 1907). One good example of the latter can be found on those columns shown on a funerary temple depicted in relief from the Tomb of the Haterii (end of the first century CE). We know of other extant columns that were decorated with horizontal bands of figural relief, such as the “Jupiter column” at Mainz (Mogontiacum) erected in honor of the emperor Nero that was decorated with five horizontal bands of figures in relief; the column, its high base, and capital stood just over 9 m in height. Proposals of antecedents have even looked to Assyrian obelisks as monuments at least conceptually related to Trajan’s monument (Schnitzler 1952). 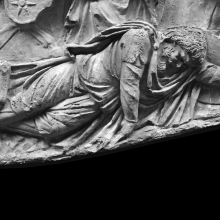 Such examples can only be considered indirect precedents, as the figural and narrative style of the reliefs of Trajan’s Column have no direct precursors that have survived. 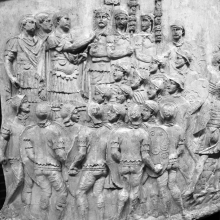 Despite the lack of clear precedents, historians of Roman art have long argued that the concept of carved pictorial representations that carry a continuous narrative is unlikely to have been born ex nihilo on Trajan’s great Column: “We cannot think of it as a sudden novelty . . . The continuous treatment on the frieze must have had some syntactic models. If these could not have the form of a spiral winding around a column, they must have had some other form” (Hamberg 1945: 120). Brilliant has described the importance of the paintings depicting scenes from military campaigns that were carried in victory processions as an important tradition. These have all been lost, but analogs such as the well-known tomb painting from the Esquiline Hill that celebrates Roman victory in the Second Samnite War serve as an important example of “superimposed registration” can be still be seen today (1984: 108). 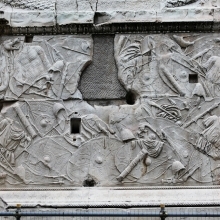 Another significant parallel is the extended horizontal frieze known as the “Medinaceli Relief” that depicted a range of scenes connected with Augustan military supremacy and the deification of the emperor, including the naval battle at Actium, processions, and sacrifice. The remarkable frieze, assembled only for the first time in 2013, was horizontal and planar, the reliefs just over a meter in height; it has been recently dated to the Claudian period and awaits full publication (Augusto 2013: 320-22). Some scholars (see in particular Claridge 1993) have questioned whether the reliefs on the Column belong to the original design of the monument: Was the Column at first intended to be undecorated and only after its erection was the concept of the spiral frieze born? Was there enough time to carve the Column during Trajan’s lifetime, or was the sculptural program a project of Hadrian? The answers to these questions ultimately rely more on speculation than on convincing evidence. The general consensus has been that the sculptural program was part of the original plan (Settis 1988: 86). Regardless of whether the reliefs were conceived from the outset as decorations for the Column, it must have been the case that carving only started after the Column had been erected; it would not have been practical to sculpt them any other way. Authorship: As there are no direct precedents to the decoration of the Column, scholars have struggled with a question that is now unanswerable with certainty: who conceived of the decorative plan and how was the end result interpreted by contemporary Romans? The name of the sculptor responsible for composing and overseeing the reliefs is lost; in modern scholarship he is often referred to simply as the “Maestro,” or the “Maestro of Trajan.” Apollodorus of Damascus, the designer of the forum complex, has been put forth as a candidate for the “Maestro.” The Column itself, a structural focal point of the forum plan, must be part of Apollodorus’s vision (Gauer 1977: 76). 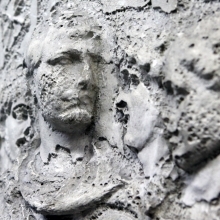 The sculptural mix of “real” history and the glorification of Trajan (see below) in the spiral relief has led Richard Brilliant to describe the Maestro as “a historian in stone, a master in the intentional sublimation of abundantly detailed, apparently factual information in formalized patterns” (1984: 100). It is interesting that ancient literary sources discuss neither the existence nor the meaning of the reliefs. Any mention of the decoration is conspicuously lacking from the dedicatory inscription on the base of the Column. The function of the Column, on the other hand, is mentioned by several later Roman-period writers. Of these, Cassius Dio is the most notable. He is our closest literary source in terms of date, even though his comments were composed nearly a century after the Column was dedicated. Visibility: Everyone seems to agree that the sculpted reliefs would have been nearly impossible to read from the ground, and only slightly less difficult from the windows and balconies of the surrounding buildings: the flanking libraries and the Basilica Ulpia (Brilliant 1984: 90-94). Only by standing close to the base of the column could one (improbably) circumambulate the required twenty-three times to follow the narrative from the bottom to the top. The sharp angle of view and the great height of the Column would defeat any attempt to “read” the reliefs without interruption. Instead, one can see individual “passages” of the sculpture and make associations between scenes that are stacked vertically above one another (Brilliant 1986). One can follow the general account without having to move in sequence from one scene to another (id.). Explanations for the difficulty in viewing the higher elements of the frieze are both numerous and speculative. It could be, as the influential Italian art historian Bianchi Bandinelli once wrote, simply a reflection of the artist’s focus on his composition without being overly concerned about its success as a form of public art (Bianchi Bandinelli 1978: 124; 139). Paul Zanker has written: “Like the sculpture on Gothic cathedrals, the images chiseled with such care were done not so much for the potential observer as for duration in eternity” (Zanker in Coarelli 2000: vii). The Maestro was neither completely unaware nor unaccommodating of this deficiency, as the band of the relief increases slightly in size as it nears the top of the column (from 0.89 to 1.25 m) as does the height of the individual figures (from 0.60 to 0.80 m). Furthermore, the visibility of individual scenes and of groups within scenes would have been enhanced by the addition of color and metal attachments. The Reliefs as a Scroll: The fact that the sculpted reliefs wind around the column like a scroll (Lat: volumen, rotulus), and that the Column was located on axis with two flanking libraries, has led to the view that the reliefs might have evoked the idea of the book or scroll in the minds of the viewer; indeed, some have gone as far as to say that the spiral reliefs actually represent an illustrated scroll (Birt 1907; Bethe 1945; Hamberg 1945: 129; Becatti 1960: 21). 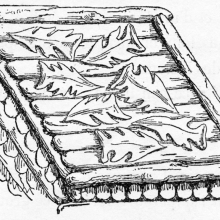 The rolled scroll was still the usual form for literary works in the early second century. Trajan himself is known to have composed a literary account of his successes in Dacia, the Commentarii. 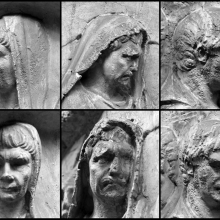 Some modern scholars thus have seen the reliefs as a methodical representation of Trajan’s literary account (Florescu 1969). In any case we can imagine that a reader of Trajan’s account in the adjacent library could gaze out and see the reliefs on the Column as illustrations to the emperor’s written story. A few Greek or Latin scrolls may have been richly illustrated, with integrated text and image. While this may be so, Weitzmann has argued that continuously illustrated scrolls did not normally circulate in Trajan’s day (1948; 1945. Cf. H. Bober’s review, 1948). Invariably Roman literary works survive in the form of medieval copies. The lack of originals makes it much more difficult to reconstruct their ancient appearance. The “Documentary” Nature of the Reliefs: An obvious but important fact is that the sculpted reliefs portray a series of contemporary events that had occurred in a specific time and place only a few years before the Column was completed and dedicated. 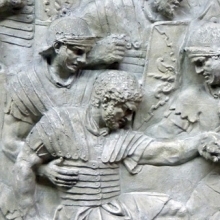 Trajan’s Dacian Wars were fought in two separate campaigns spaced closely together: the first between the years 101 and 102 and the second between 105 and 106. The reliefs on the Column treat these two episodes more or less equally, with the prominent figure of a winged Victory writing on a shield serving as the punctuation mark, as it were, between the two campaigns. The overall treatment has been described in English as “continuous narrative” and “epic-documentary” (Wickhoff 1900: 111; Hamberg 1945; Brilliant 1984: 90). The episodes depicted represent an ingenious balance between reality and fantasy. They include many details that serve to differentiate different locales and combatants, details that must have been carefully planned from the earliest stage of the project. It has even been suggested that the high level of detail was accomplished by working from sketches made in the field during the military campaigns, yet so many of the details shown are of doubtful accuracy that this view has been questioned (cf. Coulston 1990a). At the same time, for the sake of clarity and unambiguous political message, the rendition of the figures and scenes has been manipulated to create dramatic effect (Gauer 1977 for discussion on the dual purpose, historical and political, of the Column). 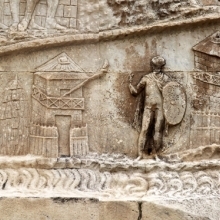 The focus on Trajan as the heroic protagonist is of course central (consider this summary of his appearances on the southeast facade of the Column). As Wickhoff wrote over a century ago: “wherever war is going on we want to know what he [Trajan] is doing, and in every fresh event we are dissatisfied till we have found out his striking person” (1900: 111). Critical events, most notably the final capture and suicide of the Dacian king Decebalus, are rendered as highly theatrical finales. The inclusion of multiple and specific details has been cited as a parallel to late Republican rhetoric, in this case to render the whole account more convincing and “true” (Von Dippe 2007: 400). Set Scenes: The campaigns and their defining battles are punctuated by certain kinds of “set” scenes that are repeated numerous times over the course of the engagements. These were first systematized and discussed closely in modern times by Lehman (1926). They include activities such as: adlocutio (Trajan addressing his troops), profectio (marching out), lustratio (sacrifice), building operations, reception of embassies or captives, and, of course, battles. Both fixed themes and individual episodes of battle are distinguished from one another by physical dividers such as walls or trees or by the positioning of figures in apposition to one another. Within these discrete scenes care is taken to distinguish between different groups within both sides of the campaign. Regular Roman legionaries are always shown wearing their characteristic body armor (the lorica segmentata, and carrying rectangular shields) and auxiliaries are consistently shown with their leather (in fact, in most cases chain mail) tunics and oval shields. The convention is followed even when legionaries are shown undertaking activities that would not have required the wearing of armor, such as clearing a forest or building a camp. Similarly the Dacians are distinguished from each other in terms of rank and class by headgear and dress.